troops are trying to take back, supported by two platoons of light tanks. We both initially decided we wanted to play the Germans, so we went to the Australian balance system to decided what we were willing to give up to get the Germans. Steve offered up an empty bid, and I gave up one level of balance, which meant that Steve got the French, and the French 9-1 leader became a 9-2. This was a game of two halves. The first four turns saw the French push forward hard, and with virtually no resistance from the Germans. My dice were ice cold, roll after roll, combined with the situation of getting the odd good shot which is then shrugged off by the opponent easily passing the Morale Check. I think in the first four turns I rolled lower than 7 maybe three times. Steve actually confirmed this with me after the game, and you know your dice are bad when your opponent agrees with you. These turns had the German squad in the back with the ATR get greased after bombing two shots at the Armored Assaulting French. At the end of Turn Four, Steve held two of the four buildings he needed for victory, and was setting up his assault on the German strongpoint, a collection of stone building next to some woods. One of the things that frustrated me through this scenario was the lack of can openers on the German side. I had the 37L guns, with H6, which (if present) has a TK number of 26! Otherwise the TK number is a not very prepossessing 9, and when facing all around armor values of 4 on the French tanks, didn’t leave a lot of hope. The first time I rolled for HEAT, I rolled a 9, so there it went, anyway. Anyway, Steve was very cagey with his vehicles, keeping them at a distance, and with only MGs as can openers, I didn’t feel that I had any chance of affecting the vehicles. Turn 5 brought about the second of two halves, and this half had things going a lot better for the Germans. I was hitting, Steve was failing Morale checks, and I was passing Morale checks. The French wave was breaking on the rock of the building complex that the Germans were occupying. 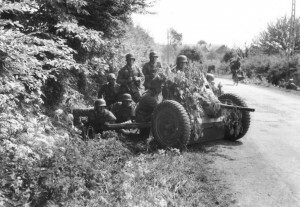 This turn saw a German squad pick up a French MMG, abandoned when its owners fled in panic. This squad sowed havoc in the French backfield, which suddenly had the backbone taken out of it. This same squad won two separate Close Combats in the woods. Now that I think of it, Close Combat ended up being the German’s best friend in this playing. I did not lose a single unit in CC, and killed 2 squads and 3 of Steve’s 5 tanks in CC. Steve kept tightening the noose in turn 6, having a platoon of 2 AFVs bypass two different buildings and restricting German fire while bringing his remaining tanks and infantry within striking distance of the last victory building. The Germans didn’t succeed on their CCRF attempts on this turn, but the remaining German Gun went on an ROF tear, landing about 6 shots without effect before Malf’ing out. The Gun came back on the next Rally phase, though, and put one of the French tanks out of its misery. This Gun was rotated 180 degrees in a Woods hex on two different turns, on the second turn getting rate but still was unable to penetrate the armor. One Immobilizing hit was scored, but one feature of these French tanks is that they can shrug off Immobilizing shots from the side on a dr of <=4, which Steve rolled. Steve’s last movement phase ratcheted up the desperation. His plan was to freeze with his tanks and charge with his infantry, but when he lost two of his remaining tanks in CCRF while maneuvering into position, he conceded that game. A very straightforward ETO slugfest. I think it favors the Germans – it’s certainly the German’s scenario to lose.